Walls are not the only mechanism for attractively and effectively dividing your office space. 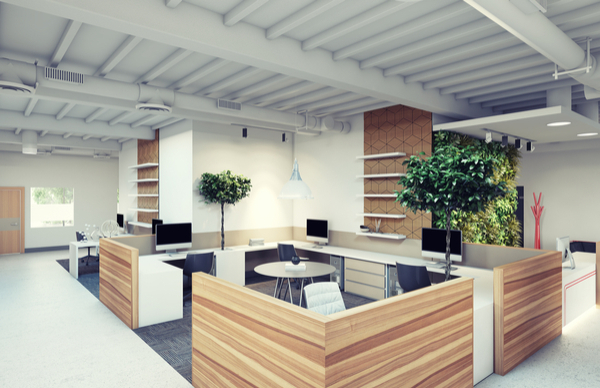 In fact, open-office plans are becoming increasingly popular. Although not everyone thrives in an open environment, office dividers and partitions can help minimize the negative attributes of an open office and maximize the positive. Consider the needs of your office and your employees in determining whether it’s time to start tearing down your office walls. Gone are the days when room dividers were nothing but gray, boring slabs. Modern dividers come in myriad styles, silhouettes, and price points. Further, if you don’t find what you need or want, room dividers can be custom built to your specifications. Today’s dividers don’t just stand there and break up space, they carve out the stylish, efficient, and inviting work areas that your business needs. Additionally, they can help direct the flow of your office space while enhancing its organization. Room dividers can be formed by double-sided bookcases that not only provide privacy but also allow additional storage to the employees on both sides. While these dividers take up more space, they are especially beneficial for offices with heightened storage and display needs. Mobile whiteboards can also serve an important role as office partitions. These dividers can effectively section off space while providing a useful work surface for presentations and meetings. They are, however, ineffective at muffling or blocking sound. Workstation Privacy Screens are small screens that can be attached to your office partitions and that allow for more privacy within the divider-created space. Cubicle doors offer another such option. These adaptations are a cost-efficient mechanism for providing your employees with more private workspaces. If you are thinking about opening up your office space, consider modern dividers and partitions. The open-office plan can be inviting, comfortable, and effective, but there is no perfect one-size-fits-all approach. An experienced office planner, like those at NPG, will guide you toward a well-appointed open-plan arrangement that will work for your business and your employees. The open-office plan is not right for every business, but it can be a great way to modernize your space. The professional office planners at National Project Group will assist you in designing an office plan that’s well-appointed, comfortable, efficient, and in line with your business needs. At NPG, we offer a vast selection of office dividers and partitions, and our massive inventory includes new, refurbished, and Grade A pre-owned. For professional guidance creating an open-office space that’s right for you, give us a call at 800-821-3522 or send us an email through our online contact form today.